Trainers and educators at companies and higher education institutions are consistently on the lookout for ways to improve the way they build and create courses for their learners. This post is an introduction to XBlocks for Open edX, why they’re important, how they work, and which XBlocks are currently available. By the end of this article, you’ll understand how XBlocks fit into Open edX and how you can use them to create engaging course content for your learners. XBlocks provide almost infinite flexibility to Open edX, and are a big reason for Open edX’s appeal to course authors, administrators, and instructors across organizations of all shapes and sizes. Virtually all of them are free – they are used to make online courses more engaging, and act a miniature web application in the same way as a website plugin would. You can combine various XBlocks such as text, video or even collaborative learning environments to make your courses stand out. The XBlock is a component architecture that allows courses to be built through the use of customizable components. Developers can also create their own independent course components that work seamlessly with other components. XBlocks allow those within the open source community to extend the possibilities of online courses. The flexibility of XBlocks makes Open edX such a powerful tool for those in the online learning space. To understand the importance of XBlocks to Open edX, we first need to understand how they fit into an entire curriculum and how we access course material. A well-defined course will be accessed by a number of different web applications. XBlocks can be used to represent specific problems such as web-formatted text and videos, drag-and-drop course functionality, multiple choice input fields or even larger projects such as interactive simulations, course chapters or the entire course itself. Drag and drop XBlock functionality. 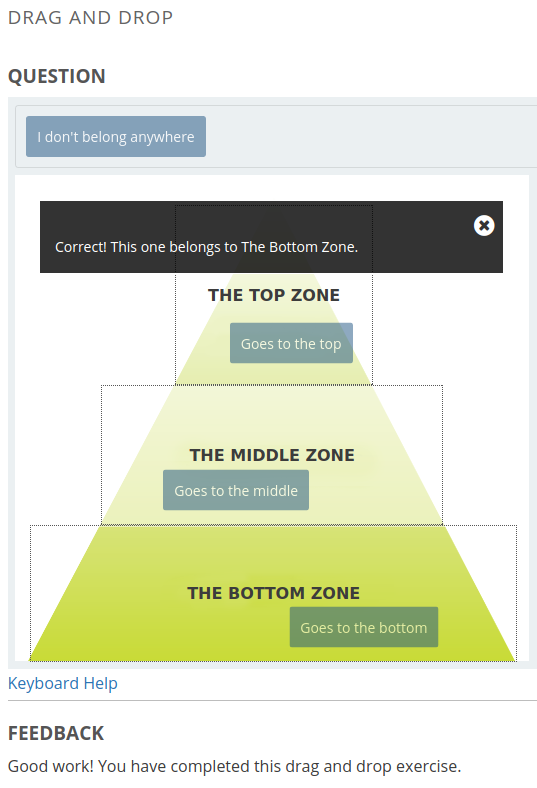 The Peer Instruction Tool – allows users to discuss questions and concepts from within the class to gain a deeper understanding of complex ideas. This is a super useful as it encourages students to not only provide an answer to a multiple choice question, but gives them the opportunity to write why they chose that specific answer. These answers are then reviewed by other course participants before a final answer and explanation are provided. Completion – Allows a learner to mark an activity as complete and earn a mark for their progress chart. Container Launcher – This is used with Appsembler’s Virtual Labs product and allows you to deliver hands-on exercises within a course. Google Drive – Enables embedding of Google Documents or Google Calendar within a course. Open Response Assessment – Provides functionality for peer assessment, self assessment, student training. Video – A video player that works with multiple video hosting sites. If you’re ready to enable XBlocks within your own instance of Open edX, this guide will help. Your XBlock should be independent of other XBlocks, meaning your entire team should be able to use a specific XBlock without also having a dependency on others. They should work together with other XBlocks, meaning you should be able to combine XBlocks in a way that is flexible for the user. In short, your XBlocks should be flexible in that if someone wants to use two or three together at the same time, they’re able to, but not require you to use one specific one to use another. Similar to how you’d use a <div> HTML tag on a website to specify different sections of content, XBlocks specifies and represents different pieces of content that can be used in your courses. If you want to install XBlocks you’ll need to access your advanced settings within your instance of edX. There are a wide number of XBlocks available for the Open edX platform which can be installed by anyone running their own site for course authors to use. 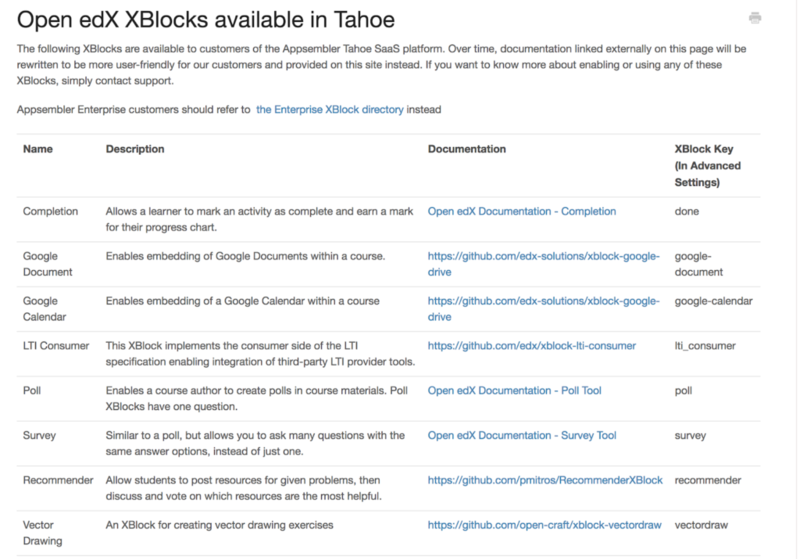 For a full list of up-to-date XBlocks currently available to customers on Appsembler’s Tahoe platform, check out our Knowledge Base. Have any questions or want to learn more about Open edX? Get in touch!